Between the piecemeal volume sets and the “Star Wars” parody episodes, Fox has made a mint screwing over the fans of “Family Guy.” You know, the ones that helped bring it back from cancellation? And apparently, they’re not afraid to admit it, because it takes pretty big balls to release a 23-minute episode on DVD just because it never aired on TV. 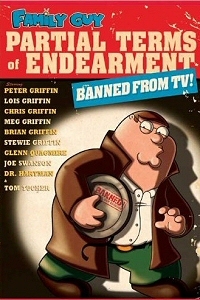 The episode in question, “Partial Terms of Endearment,” was supposedly deemed too controversial by Fox and pulled from their schedule. But after watching the episode – which finds Lois agreeing to be a surrogate mother for a couple, only to consider abortion after they’re killed in a car accident days after conception – it’s really not as bad as you’d think. In fact, I wouldn’t put it past Fox to have created the media frenzy themselves just so they could put out a DVD. It’s hard to imagine anyone paying $10 for a single episode (especially when they could have easily included it in the next volume set as a bonus), which is too bad, because it’s one of the funnier episodes in years, with an awesome Road Runner/Wile E. Coyote gag and lines like “Wow, thanks a lot for 9/11, abortion enthusiasts!” The addition of extras like an audio commentary, a live table read, and “Seth & Alex’s Almost Live Comedy Show” is supposed to make you feel better about the high price tag, but it won’t. Rent it from Netflix or, if you absolutely must, find it online for free. Welcome back, my friends, to the experience that has been lovingly described as being “like the Bataan death march, but with cocktails.” I speak, of course, of the Television Critics Association press tour…but, then, if you’re a regular reader of Premium Hollywood, then you already know that I visit California twice a year – first in January, then in July – in order to get the details on what new programs the broadcast and cable networks will be bringing you over the course of the next six months. Myself and my TV critic peers will be spending the better part of the next two weeks in a big ballroom at the Beverly Hilton, watching and listening as the casts and creators of the various new series trot onto the stage, answer our questions and address our issues, and make room for the next series. Then, at the end of most evenings, there’s a big party with most of the folks we’ve seen during the course of the day, and we get the opportunity to chat one on one with as many of them as we can wrangle. Oh, sure, there are free drinks to be had, but when you’re trying to play the part of a proper journalist, you can’t indulge but so much…well, not ’til you’ve gotten all of your interviews, anyway. Fortunately, the first day of the Summer 2010 TCA Press Tour started slowly, providing visits to the sets of a few series, a trip around the Warner Brothers studio lot, a ride on the latest addition to the Universal Studios tour, and – to ease us in slowly – only two proper panels. 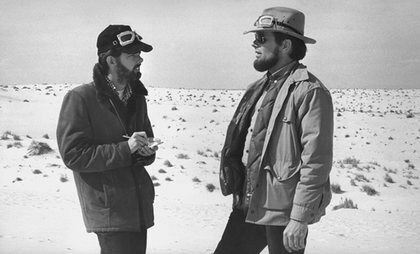 We did, however, get a few Q&A ops while at the various sets, some of which were decidedly more impressive than others. 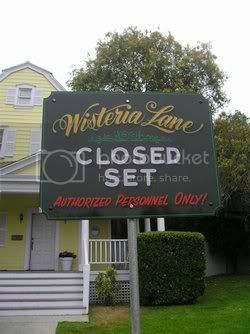 Having never watched a complete episode of “Desperate Housewives (I rather expect I’d like it, but there just aren’t enough hours in the day to play catch-up at this point), I had no personal investment in visiting the set for Wisteria Lane, but when you’re a heterosexual male and you’re presented with the opportunity to stand within a few feet of Eva Longoria Parker, you don’t turn it down. Unfortunately, it took us for-freaking-ever to finally make our way to the set, as our bus driver apparently had no clue as to its whereabouts, aside from the fact that it was located somewhere on the Universal Studios lot. As a result, instead of getting to enjoy a leisurely breakfast on the set before beginning our interaction with series creator Marc Cherry and members of the show’s cast (Longoria Parker, Felicity Huffman, Marcia Cross, and new addition Vanessa Williams), I got off the bus and barely had a chance to grab a cup of coffee and a bagel before the proceedings had begun. Cherry and the cast appeared, cheerily greeted the assembled critics and thanked us for coming to the set, then split the group, with Huffman and Williams setting up camp in one house and Cherry, Cross, and Longoria Parker in another. Even if Eva hadn’t been in the mix, I knew from previous TCA experience that Cherry is always entertaining, so I followed him and his Housewives inside to hear what they had to tell us about the upcoming season of the show. At first, Eva was going to speak to what we could expect from Gabrielle’s storylines this year, but she stumbled almost immediately, admitting that she couldn’t remember what Cherry had told her she could say and what she couldn’t.